Kumiko is certainly a unique individual. She lives in the sprawling metropolis of Tokyo but remains an utterly isolated woman existing in a decomposing world. She hates her dead-end job where she spits in the boss’s tea. She is unsociable refusing to interact with her fellow co-workers. A friend sidles up to her on the street and she all but ignores the perky creature. Her overbearing mother incessantly nags her to get married. She is extremely withdrawn. She’d rather spend all her time carefully re-watching a distorted VHS tape of the 1996 movie Fargo. Can someone please give this woman a hug? It’s important to note that the Coen brothers picture begins with a title card that reads: “This is a true story.” She finds the tape in a seaside cave. It’s battered and worn. The film is grainy. Fargo has some pretty ardent fans so if you’re going to choose a movie to obsess over, I suppose that is as believable as any. Personally I’d pick The Fifth Element but hey that’s just me. Anyhow, Kumiko is somehow convinced that the briefcase full of money Steve Buscemi buried in the snow is real. Armed with a hand-stitched map, she decides to travel to North Dakota and find the cash. The events depicted in Fargo are fictitious. However Kumiko, the Treasure Hunter is partially based on fact. Apparently Takako Konishi was a real woman from Tokyo who was found dead in a field outside Detroit Lakes, Minnesota in 2001. Her death was ruled a suicide, but a conversation between a local police officer and Takako led to speculation by the media that she had died trying to locate the missing money portrayed in the movie. It was a fabrication, but the misunderstanding grew into an urban legend about the woman. Her tale was detailed in the 25 minute short This Is a True Story (2003), directed by Paul Berczeller. That the details of this are far more fascinating than what is presented here highlight my lack of passion for this production. Kumiko, The Treasure Hunter concerns an obsessive quest. Generally I enjoy these tales about social outcasts that don’t quite fit in with society. These quixotic individuals have such a romantic quality that can be very appealing. 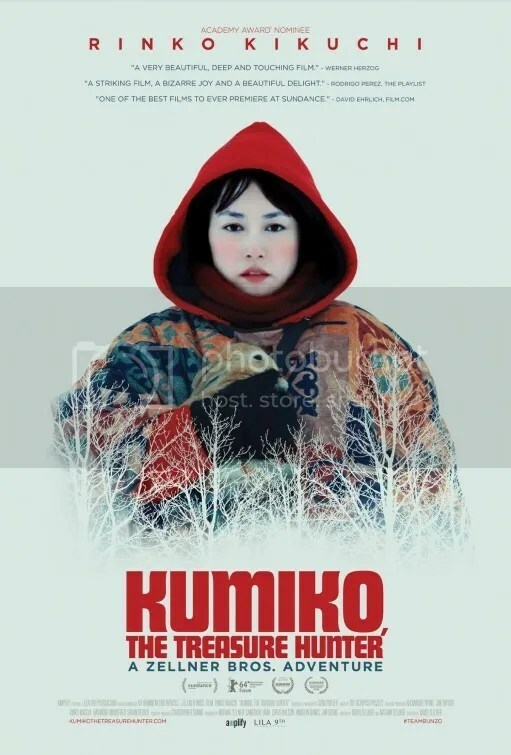 Kumiko is outfitted in scarlet sweatshirt with a large hood like a contemporary Red Riding Hood. That visual further pushes the fairy tale notion of this modern fable. Indeed there’s an air of surrealism that infuses her life as if it were a dream. But Kumiko is such an enigma that it’s difficult to embrace the character. We don’t know this woman. She rarely speaks, only occasionally mustering out a random word in her broken English. The locals along the border of North Dakota and Minnesota just want to help her but she is so painfully shy that it’s hard to summon any interest in her mission. Kumiko is a curiosity to be sure but not someone I embraced. Her only friend is a pet rabbit named Bunzo. I think it’s telling that her animal side-kick is the emotional heart of the saga. I’m #TeamBunzo all the way. #TeamKumiko not so much. This entry was posted on May 6, 2015 at 9:11 am and is filed under Drama with tags 2015. You can follow any responses to this entry through the RSS 2.0 feed. You can leave a response, or trackback from your own site. I was hoping to like this, but was very disappointed. They could have livened it up a little. I got kinda bored. Your review drew more interest to me than the actual movie itself. 2 stars for Bunzo. It was hard to care about her plight. Bunzo was the character with the most humanity. Too bad he was a rabbit. When Fargo is used partially as an escape, you know you have a pretty drab film. 😉 i doubt I’ll be seeing this one, though I’ve heard some pretty good things. I’d also obssess over The Fifth Element! I guess we’re more alike than I thought. Haha. One of my coworkers told me about this film and what a miserable experience it was watching it. She kind of wants me to see it to hear my take on it, but I’m not feeling enthusiastic about doing that when I read reviews like yours. I think there are better ways to spend my time. One of your coworkers wants you to watch a film she called a “miserable experience”. Hmmm I’m not sure if she is your friend. Ha ha.